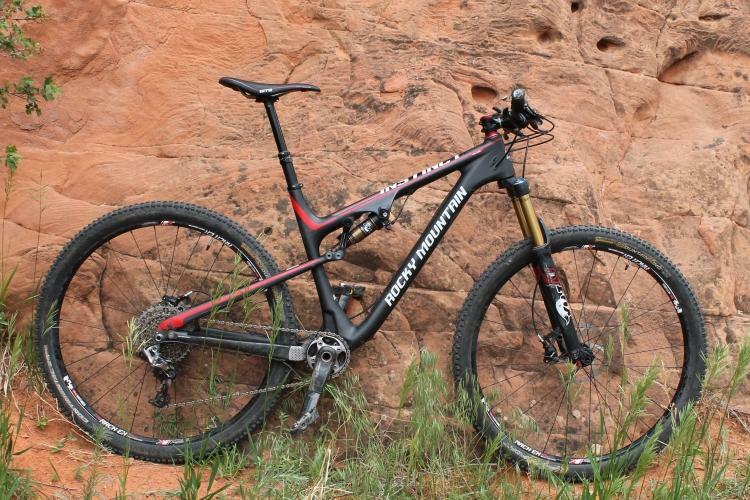 A bike like this aluminum-framed Rocky Mountain Thunderbolt could easily sell for an additional thousand dollars. In fact, a near comparable model does sell for a thousand dollars more, but with a carbon frame. The C50 shares most of the same components as the A50 including the wheels, suspension, tires, and cockpit, but with a different dropper post, and a slight upgrade in brakes and drivetrain. 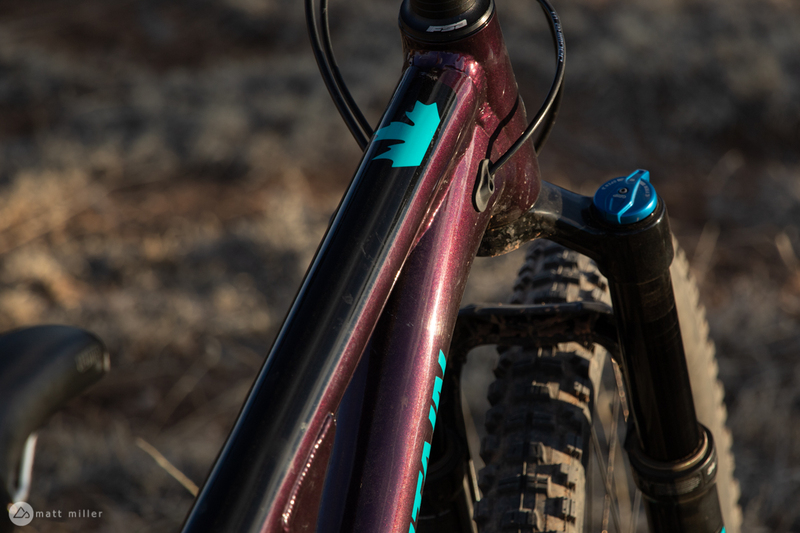 The C50 frame is sleeker without welds, but just look at that purple sparkle in the sunset. 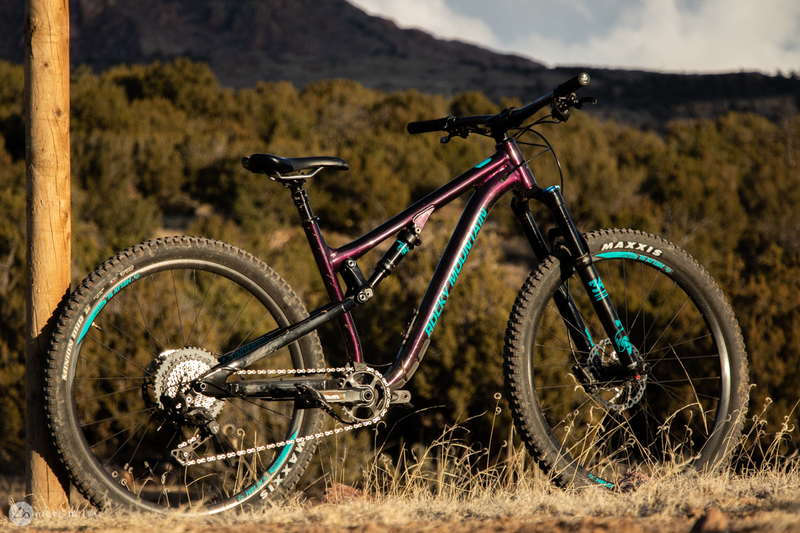 The differences between the A50 and C50 are nearly splitting hairs, which is why it’s great that Rocky Mountain offers the A50 for folks who aren’t interested in a carbon bike. The Thunderbolt A50 has an aluminum rear and front triangle, with an aluminum Rocky Mountain OEM cockpit, aluminum Sun Ringle rims, and DT Swiss 370 hubs. Entry-level Shimano MT500 brakes slow the bike and a Shimano SLX shifter and cassette, along with an XT derailleur, make up the drivetrain. 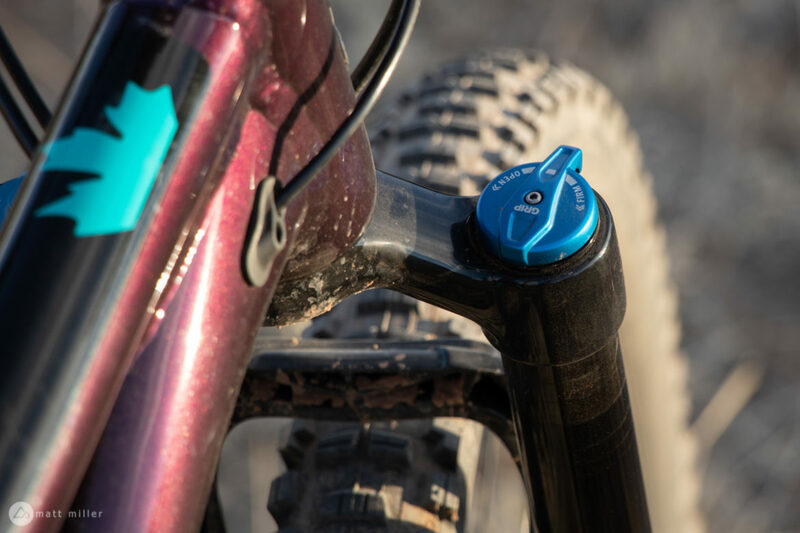 The Thunderbolt A50 also gets a Fox rear shock and a Fox 34 Float Performance fork with a Grip damper. All this comes in under $3,400. 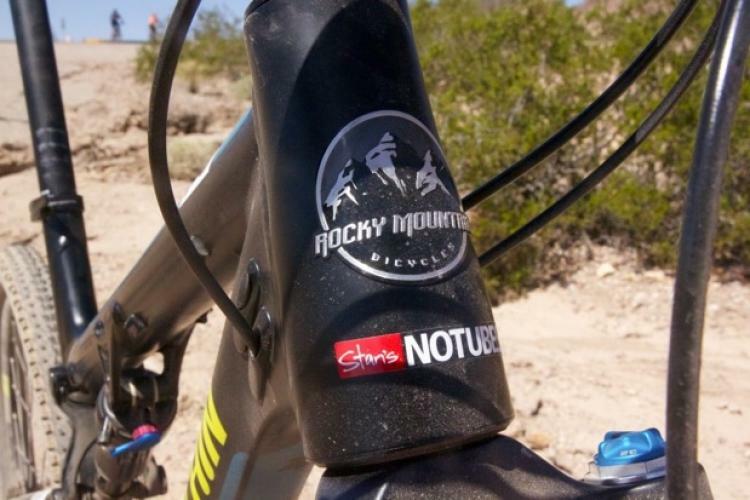 The Thunderbolt, like most other Rockys, has the Ride-9 system, a little flip-chip near the rear shock’s bottom bolt. Thus, there are nine different geometry settings that can change the geo by close to a degree-and-a-half. That’s a lot of geo settings, but there are really three standardized settings: slack, neutral, and steep. Slack is 66.4-degrees, neutral is 67-degrees and steep is 67.6-degrees. 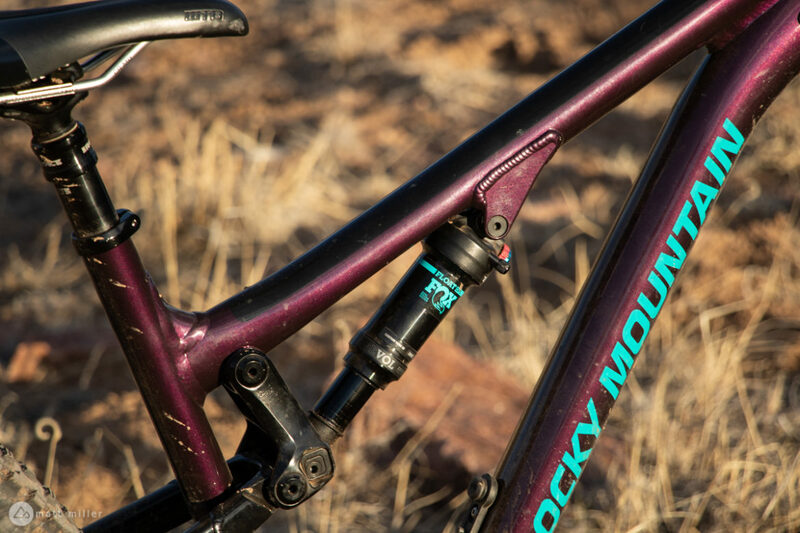 The seat tube changes from 74.4-degrees in slack, to 75-degrees in neutral, and 75.6-degrees in steep. 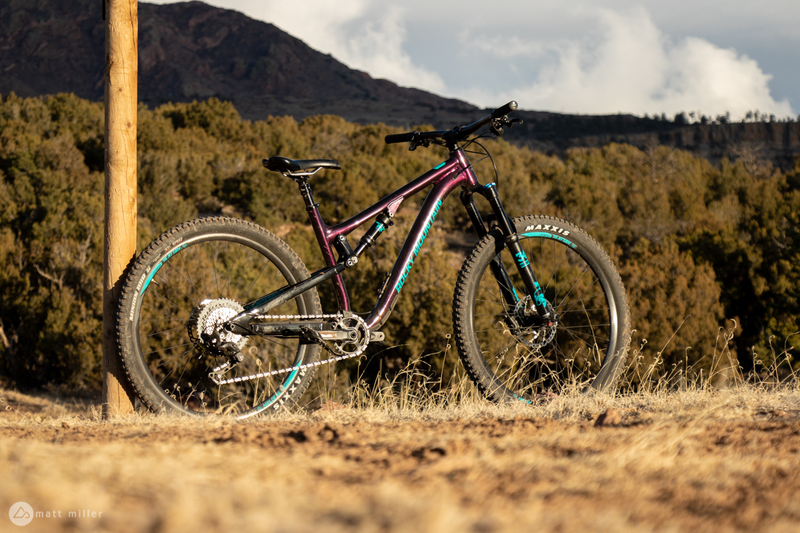 The chainstay length is a 425mm — short and snappy — and the wheelbase length implies that it’s meant to be a nimble and agile trail bike. 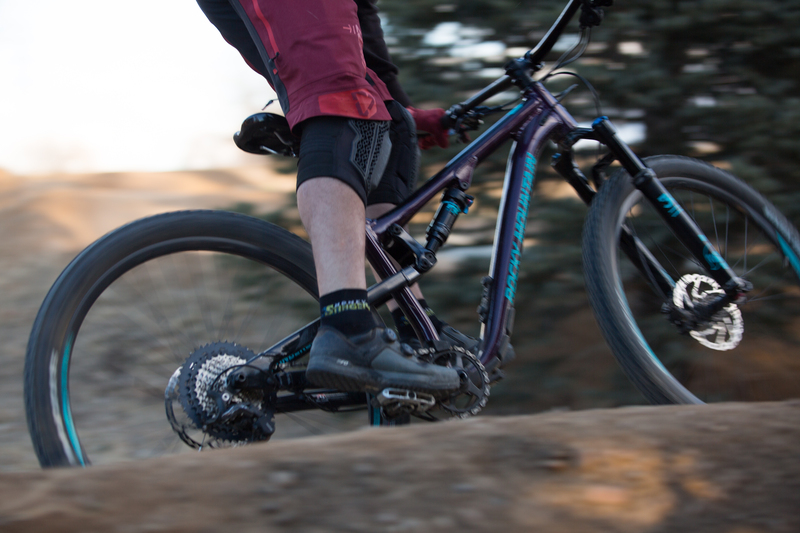 Take the 130mm travel front and rear and it sounds like a go-far trail bike. Then take the geometry that is almost in enduro territory from a few years ago. Ride the Thunderbolt, and the answer is clear. Most people would reach for their six-inch travel bike on a trip to Moab, but I was curious about the Thunderbolt’s ability when I went there in December. The bike’s travel suggested I might want a little more on the sandstone drops and layers, but the angles told me I’d be fine. Mag-7 always seems to be a pretty long day and it can be an even longer day if you don’t like to pedal the bike you’re on. 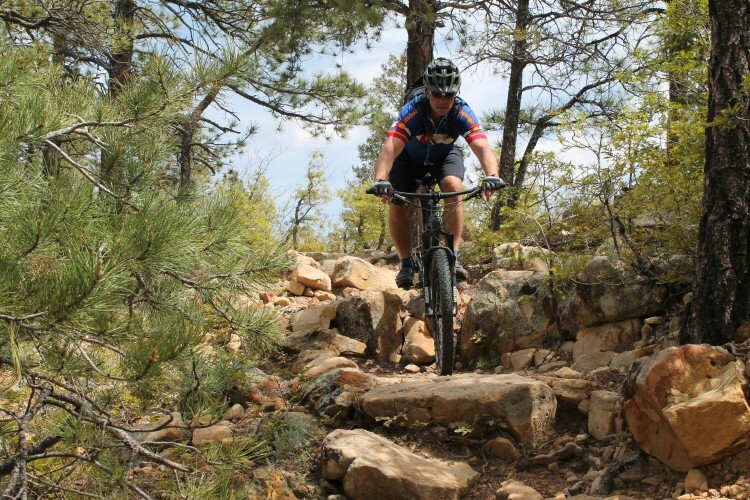 There are a few big descents, but nothing like Porcupine Rim, and the descents are broken up by some tough climbs. It’s much more of an up-down dance than a full-on smash fest. When descents petered out and the trail shot upward, my buddies dismounted and started pushing. I, on the other hand, stayed in the saddle and grinded upwards. There were a few moments when I wished I had 10mm more fork travel, but for a long and technical trail like Mag-7, the Thunderbolt was a perfect match on everything except Portal trail. Most of the time when I get a new review bike in, it takes a handful of rides before I really feel comfortable on it, because I have to learn body positioning, how it reacts to speed, or get the controls and levers dialed in. I never felt like I had that learning curve with the Thunderbolt, though. 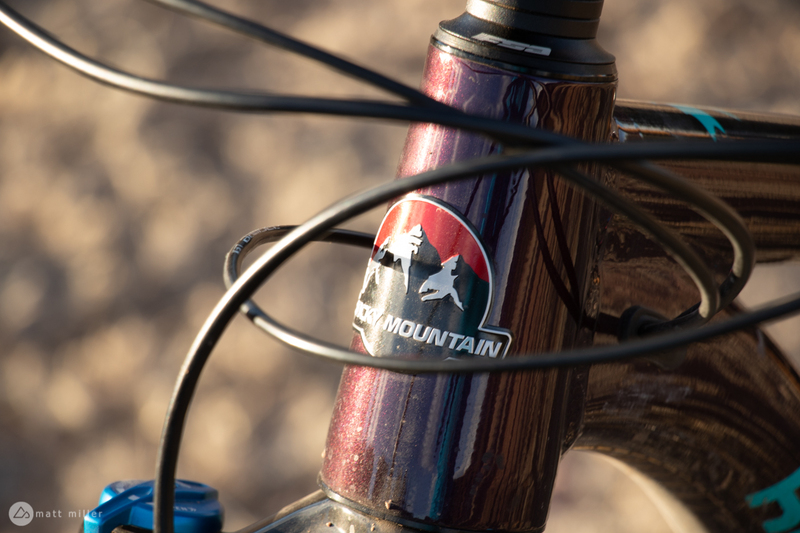 It’s a very comfortable mountain bike to be on whether it’s the first ride or fiftieth. For the most part, there were hardly any surprises in store. Climbing on the Thunderbolt matched my expectations. It’s not an XC bike, but not a long-travel bike either. I guess you’d just call that a trail bike, huh? In the neutral setting, the seat angle stands at 75-degrees in a pretty forward and upright position for climbing. My challenge for the Thunderbolt was figuring out the proper sag. Even when I ran high-pressure in the rear shock, I couldn’t avoid pedal strikes while climbing. The slack setting resulted in far too many strikes. The neutral geometry setting was better, but I still caught a lot of rocks. 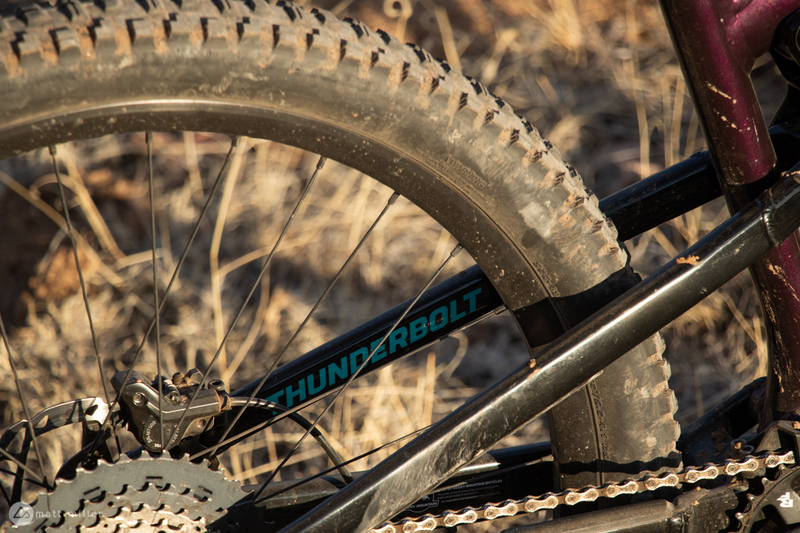 The steep setting for the Thunderbolt raised the bottom bracket enough to keep the pedals above ground, but that’s not the best setting for the Thunderbolt’s personality. If I was lining up for an XC race with the T-bolt, I’d put it in the steep setting, but for the best of everything and fewer pedal strikes, I found the neutral setting optimal. The kinematics on the Thunderbolt are interesting for a 130mm bike. It doesn’t have a notable mid-support feeling and ramps up much later in the travel. These traits could lend to the number of pedal strikes I experienced since the Thunderbolt doesn’t hang around that 30% mark on the climbs, and the bottom bracket drops lower as you make your way up technical and rocky trails. 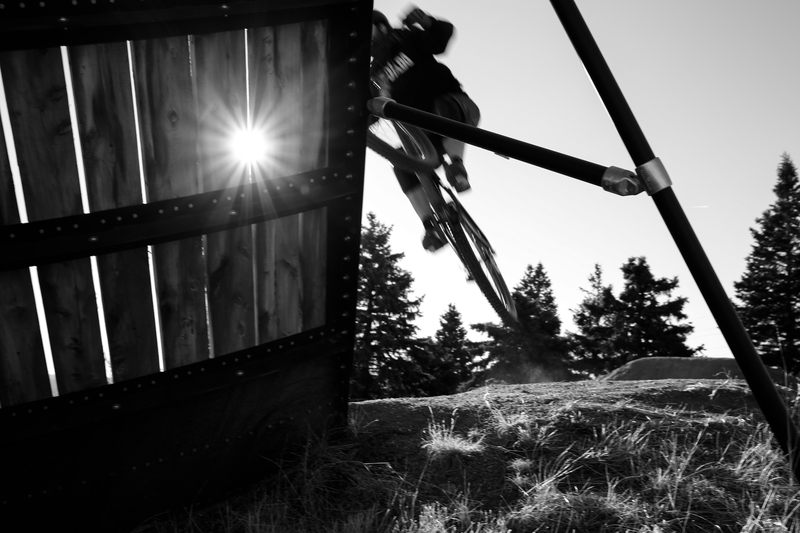 What goes up, must come down, and that low bottom bracket comes in handy through corners and curves. 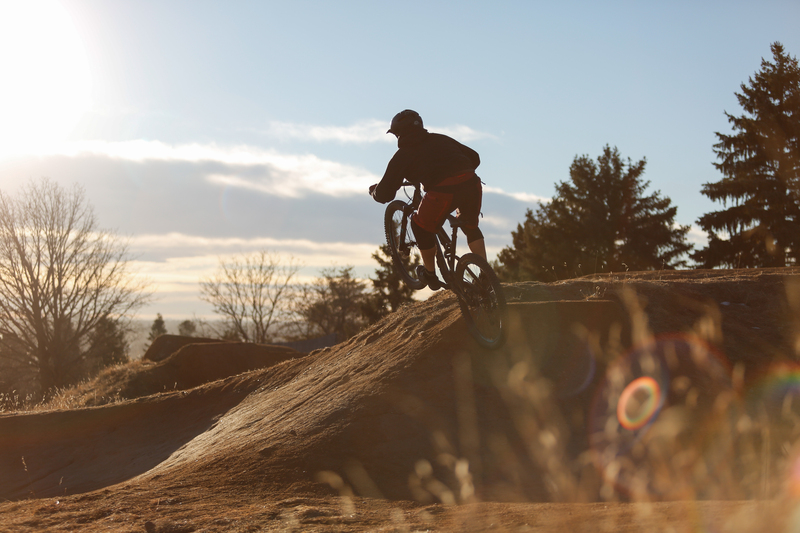 The bike tracks oh so well, and loading up the rear suspension through berms is irresistible. The Thunderbolt is just as comfortable to corner on flat turns. 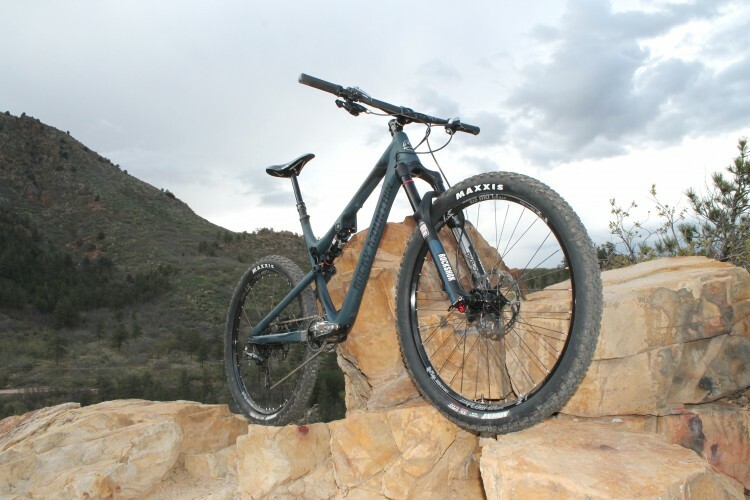 The Thunderbolt is “enough bike” for the vast majority of mountain bikers out there, and for those of us who think we “need” a big ol’ six-inch travel bike for descending all the time. The geometry kept me going on steep sections. I did wish for a little bit more travel in a few places, and on that note, Rocky Mountain does make the BC Edition with 140mm of front and rear travel. On fast and rocky lines, the Fox 34 Float Performance with Grip damper lacked some small bump compliance. It’s hard to complain about this though because it’s still pretty sweet to get a Fox 34 at this price point. The rear suspension is sensitive enough for small bumps on any terrain, and really plush on drops that should’ve felt harsh, but never did. I know I made it through the rear shock’s whole stroke length on a few drops here and there, but if I hadn’t looked at the travel indicator, I wouldn’t have noticed. It does seem like the new Thunderbolt lost a little bit of the pop that it used to have. Maybe that’s because it got a little bit more travel. The upshot is it isn’t any tougher to get it off the ground. The Thunderbolt is a blast to jump, and wheelie, and still has the energy of a four-year-old who ate a box of Gushers. 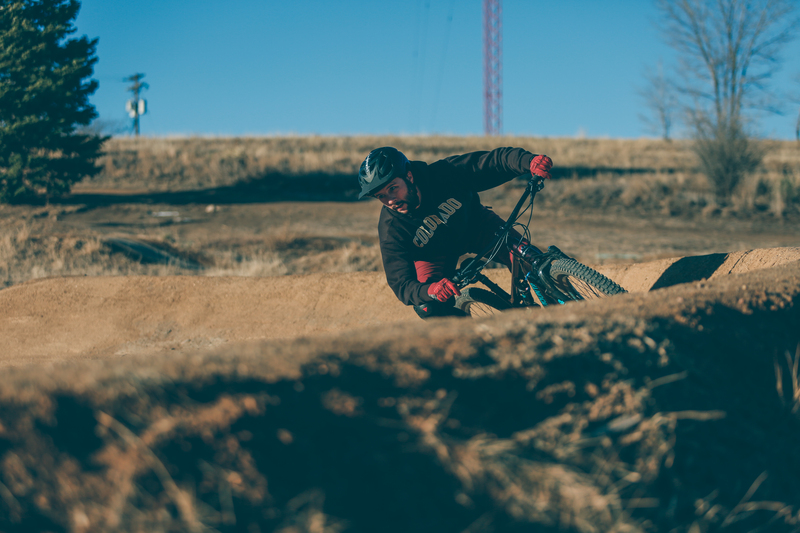 It’s one of my favorite bikes to take to the bike park and send off kickers, doubles, wall rides, or makeshift features that anyone can find on their local trails. With 426mm chainstays, it leans back like Fat Joe when it’s time for wheelies. It’s easy to see why this is Carson Storch’s go-to bike for slopestyle courses. I think if I were to buy the Thunderbolt A50, my first upgrade would be the handlebars and grips. I swapped to a set of carbon bars during my testing and it made a huge difference smoothing out some of the small bumps from the front end. The stock grips aren’t very ergonomic either. A little bit of stock downtube protection. The Shimano SLX and XT drivetrain work great. It’s not the fastest or most crisp drivetrain, but for the price, it’s spot on. 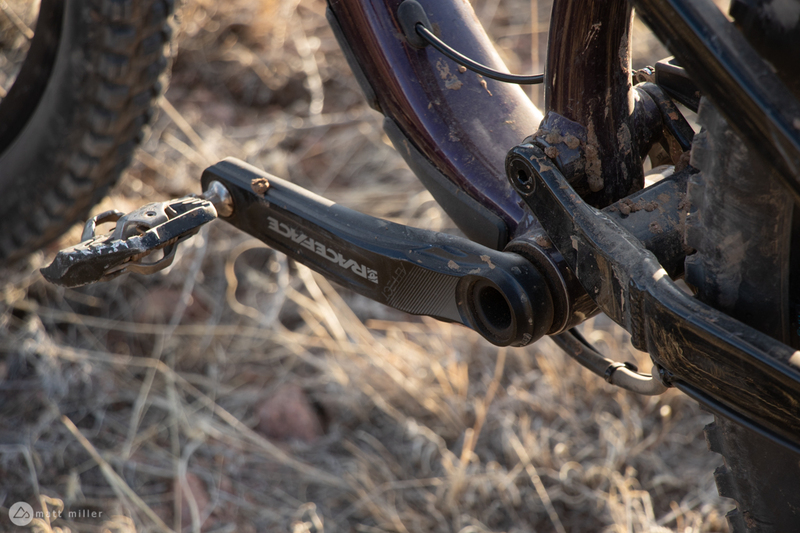 The Shimano MT500 brakes worked fine as well, but there were a few times I wished for more power on the long descents of Mag-7. The bike also ships with tubes, so actually, converting to tubeless might be my first upgrade. The tires and wheels are tubeless-compatible, so buyers just need to pick up a set of valves and some sealant to make the switch. The Race Face Aeffect dropper also worked great. Personally, I’ve never been a big fan of the Aeffect remote, but it’s a reliable dropper. 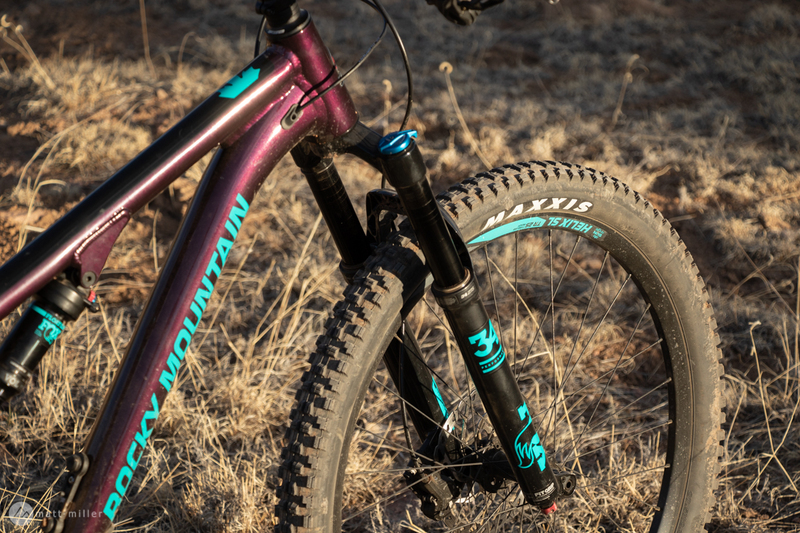 The tire setup for the Thunderbolt is a little unique in that it comes with 2.3-inch Maxxis DHRIIs both front and back, and I think for this bike, it’s a great choice. They roll fast, corner well, and still have punch when things are a little loose. 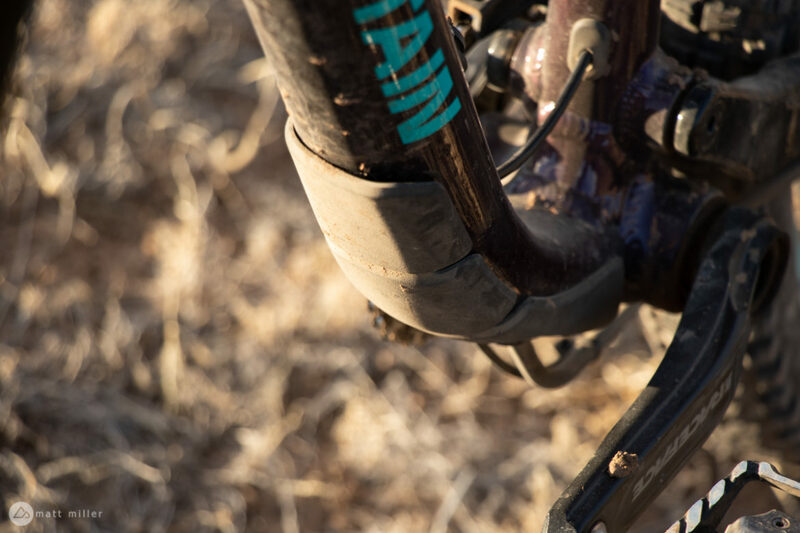 Finally, it’s still pretty sweet to get a Fox fork with Grip damper and a Fox rear shock at this price point. It’s only tunable with volume spacers and low-speed rebound, but buyers in this price range probably aren’t going to be performance or tuning geeks. The suspension package really offers enough performance to satisfy most anyone. 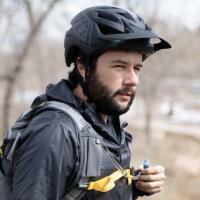 We’ve made a few mentions on the site in the past months about how mountain bikes are getting more affordable and that aluminum frames are helping. The Rocky Mountain Thunderbolt A50 is a shining example. 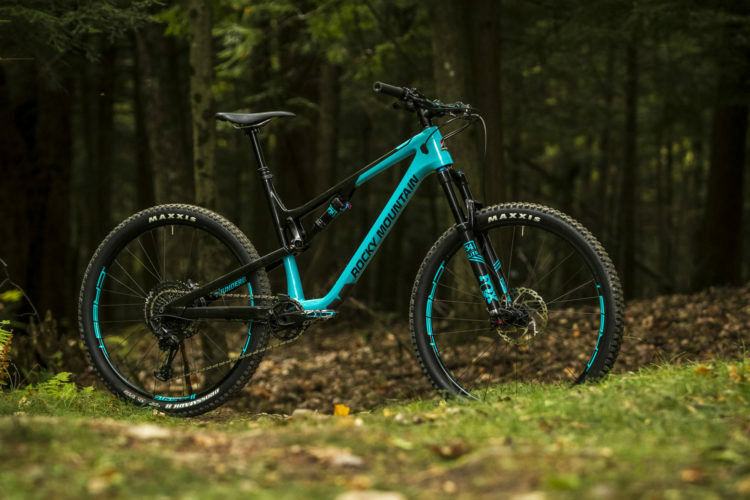 The components aren’t the fastest or lightest, but they’re pretty damn good and this bike brings performance to a realistic price point. 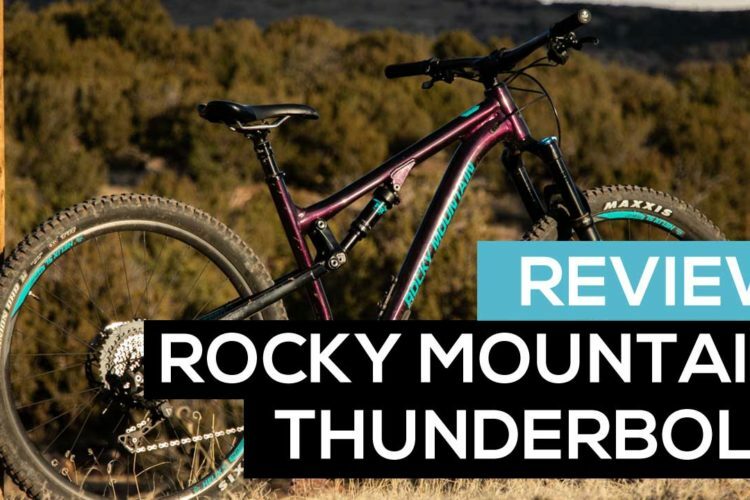 To see the Rocky Mountain Thunderbolt in action, check out Matt’s video review. It names any other price conceptions of this and other brands (especially for carbon builts) as quite “surreal”. haha thanks, I think it’s a killer price and you get a really decent build.